Students should have successfully completed an appropriate QQI Level 5 award such as Software Development (Year 1), Computer and Network Maintenance (Year 1) or Computer Games Programming or Design, all available at Cavan Institute. Equal consideration will be given to mature applicants (those aged over 23) who do not meet this entry requirement but can demonstrate relevant interest and experience. This course may also be of interest to graduates with qualifications in non-computer disciplines who wish to pursue training in the area of software development. 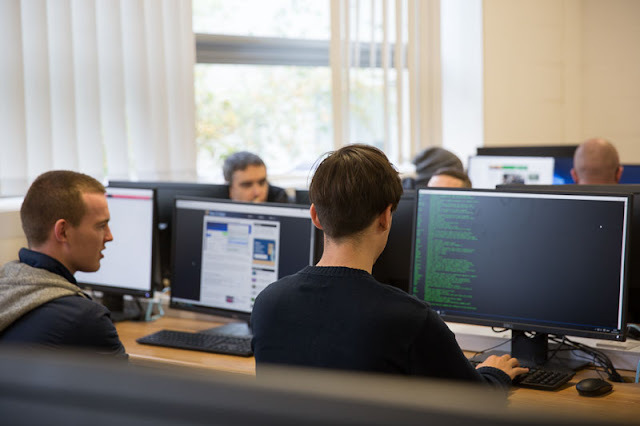 The course provides students with the opportunity to become skilled in the highly sought after art of computer programming. Participants will build on their existing knowledge of software development. The main programming languages taught are Java and Visual Basic. On this course Java is used mainly to build mobile apps for the Android platform; VB is used to teach Graphical User Interface (GUI) programming. All programming is taught in a fun and interactive way and there is a strong emphasis on experiential learning with students learning by doing (rather than by observing). The range of subjects on offer reflects the strong employment demands and trends that currently exist within the software sector. The inclusion of subjects such as Project Management, Mathematics, Communications and Software Architecture should greatly enhance employment prospects for successful graduates. The course is delivered over 4 days per week giving students the opportunity to use the 5th weekday to gain relevant work experience. This opportunity has led to gainful employment for many students in the past. Ireland is widely recognised as Europe's premier location for software development. Opportunities are very plentiful in the areas of computer programming, system analysis and design, software testing, technical writing, database administration, technical support as well as website design and development. International travel is very common and so too, is the opportunity to work from home. With some experience, careers can progress into the areas of system architecture, project management, marketing, sales, and the very lucrative software consultancy business. Current skills shortages means employment is virtually guaranteed, particularly for degree level graduates. Graduates are eligible to apply through the Higher Education Links Scheme for entry to a range of higher certificate and degree programmes at Institutes of Technology and Universities (please check with the particular institution regarding local eligibility requirements). Cavan Institute has a number of 'advanced entry' arrangements with a selection of Institutes of Technology whereby graduates who have completed a level 6 courses are eligible to apply for direct entry into year of a 3-year Level degree programme in a related discipline.